As we tweeted last night from our @FFBonuses account Rocketmiles is celebrating their first anniversary today with a one day promotion. 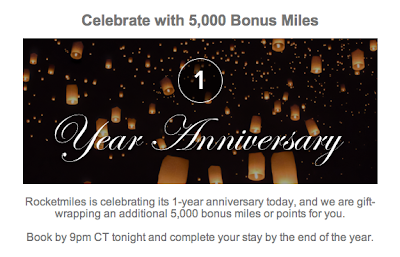 That promotion is 5,000 Bonus Miles in the program of your choice that is partnered with Rocketmiles for stays that are booked by 9pm CT tonight and completed by Dec 31, 13. You must book your stay via the special promotion page at https://www.rocketmiles.com/anniversary/ but if you are not a member of Rocketmiles yet you can join via our referral link to earn 1,000 more miles on your first booking and we'll get a referral credit of the same amount. So if today will be your first time using Rocketmiles you should be able to get 6,000 bonus miles over and above what they award for the stay itself.